So either Chef enjoys watching me squirm or the school is secretly plotting against me, because when I walked into pastry class on Friday Chef announced that I was in charge…of the class. But I’m four desserts and days ahead of myself, so let me go back to Monday. 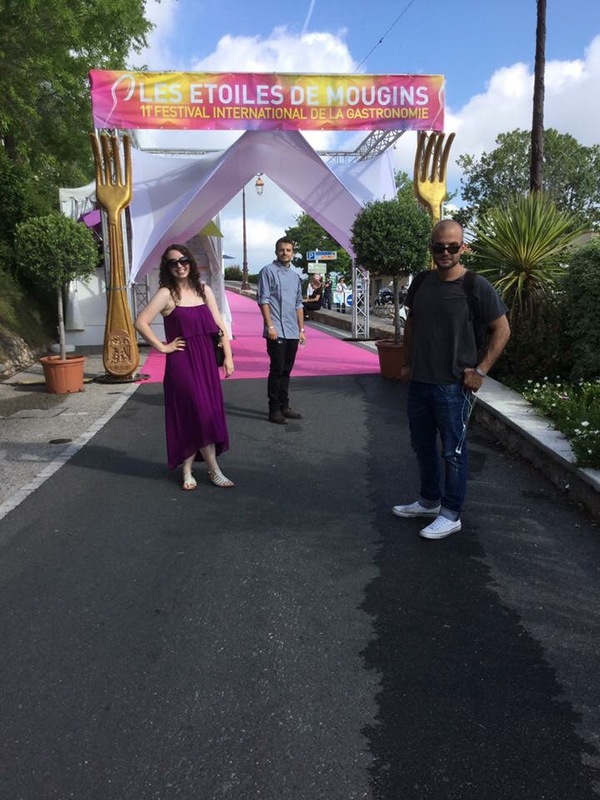 Monday was not just the start of a new week for us, it was the morning after the Étoiles de Mougins gastronomic festival–where I went for the weekend along with some other students to watch our Chef compete and participate in some demonstrations. Needless to say, Chef was running on about two hours of sleep after a very busy weekend, and some of the rest of us still hadn’t switched back from our weekend-vacation mindset. Luckily we only had four recipes to prepare–two types of sanded dough, our flan filling, and the base of our caramel crunch. Probably because we only had four recipes to complete within two and a half hours, and for the most part they were simple and self explanatory, we all worked relatively quickly and cleanly. This is really worth noting though, because our class really has a bad case of lack-of-organization-itis along with relatively weak teamwork skills, and on Monday it was so incredibly satisfying to see that start to swing in the direction of working well as a team. On Tuesday we successfully finished our flan entremets by adding some chantilly cream to the sanded dough and flan cream that we had baked on Monday and added our now completed caramel crunch topping. It certainly wasn’t what I was expecting when I saw “flan” on the list of desserts for the week, but let me tell you, its really amazing. The delicate crunch from the caramel on top is perfect with the creamy vanilla flan and the crunch from the dough at the bottom. That done, we worked hard to get everything for our blueberry cheesecake entremets completed so that the base of the dessert could sit in the blast freezer overnight. Which of course meant finishing our sanded dough, making the baked cheesecake layer, the blueberry marmalade layer, and the creamly cheesecake layer. (And no, I still haven’t figured out how to translate “creamly” appropriately into English T_T The struggle is very real). Once again we worked well, to the point that we were able to prepare the ingredients for one of our recipes for the next day to allow for a continuous progression of organized working. Unfortunately I think preparing for Wednesday made the universe think we were being cocky about our newfound ability to work well in the kitchen, and Wednesday returned to being a bit of a struggle. However, we still successfully glazed our blueberry cheesecakes and somehow managed to complete our chocolate cakes. Which, by the way, were being tested by our class because it was the first time Chef had ever made them! So we asked what the purpose was in the cake to whip everything so long and forcefully. He was only semi-serious though, as the whipped liquid ingredients allowed for an incredibly fluffy and delicate texture when the cake was finished. Things got a bit tricky from there–and here comes the experimental part of it–because the goal was to get a bar of frozen caramel to suspend inside the loaf cake. This required baking the cakes for a few minutes before removing them, cutting into them, placing the frozen bar of caramel, then putting the cake back into the oven quickly enough that the bar of caramel was still frozen and the cake was uncooked and warm enough to meld back together over the hole we cut. It actually turned out great, and after this lengthy process we flash froze the cakes before dipping them in a glaze and topping them with chocolate cream and toasted almonds. I really liked how it was simultaneously a very simple and very complex recipe at the same time, and that it is something that I could definitely recreate at home on a small or large scale. Thursday was…well…a bit of a disaster. Mostly due to the lack of our organization skills. The recipes we made weren’t too complex, but there was a lot of variety to what we were doing, and it did require listening attentively to everything that Chef was saying, and completing everything in a timely manner so that the entremets was completed enough to sit in the blast freezer overnight and be ready for Friday. We made it–just barely. The first thing we made was an amazingly soft biscuit scented with orange zest. And let me tell you, I could have just left it at that! The biscuit is so good, I really don’t even have the words to describe it. For now just take my word for it, and hope that I soon come to wherever you are and make it for you. After the biscuit we made a cream and meringue, and filled dome molds with cream, meringue, and a circle of biscuit, then froze it so that we could remove the domes and create *perfect* circles so that in the end the dessert would look like a real orange. (And in the end, only Chef and our star student succeeded in making desserts that didn’t have awkward indents in the sides where the two halves met). And now we have made it to the story I started telling you way at the beginning of this post. So, all calm, peaceful and unexpecting, I walked into class ready to make our final entremets–and also ready for the weekend ahead. Chef was also super calm, and as he pulled out his recipes for the day, he very casually mentioned that he wouldn’t be the chef today, that all the recipes were similar to ones we had already made and we were ready for this. Okay, I’m thinking, we are going to be turned loose and we will be working by ourselves–I’ve got this. Of course, that’s when Chef decides to announce that I am to be the Chef in charge and that another student, Ana, is to be my sous chef, and that we are responsible for everything getting done–from the completion of the orange dessert from Thursday to the entire last entremets and also the deep cleaning that happens every Friday. Obviously my gut reaction was to complain, but Chef was already anticipating this and just as soon as I opened my mouth to say something, Chef looked at me, told me to shut up, and kept talking. We were let loose in the kitchen, and I quickly divided the students into teams to gather ingredients and prepare for each of the recipes. The beginning of the class was a bit rocky, which was really only to be expected, and Chef came over once or twice to tell me that the first part of our dish really had to be in the oven immediately if we were going to be able to finish on time. Somewhere about mid-way through the class, we seemed to hit our stride. I’m not entirely sure how we did it, but somehow we managed to complete 12 finished citrus tarts, dip our orange entremets, and finish cleaning all before the bell for the end of class rang. Maybe its pride over having helped to lead a successful class, but I think the citrus tart is my favorite dessert from the week. It is so vibrant and fresh, and without being too complicated or messy it has a really great variety of flavors and textures. Definite success in my mind. I’m so sad that this week was the last Entremets Week at Gastronomicom for me! Only two more weeks now before I leave the nest for my internship :O Can you tell how terrified I am? Thanks for reading and come back soon for more stories about my final weeks at Gastronomicom and then the beginning of my new adventures on the Cote d’Azure!